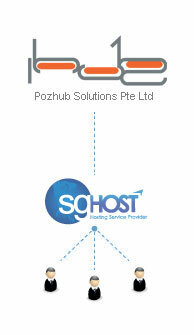 Since our inception in May 2002, SGHost.com - a web hosting division of Pozhub Solutions Pte Ltd, has empowered a diverse range of businesses; enabling us to establish our brand on the Internet as well as to deliver marketing messages to a broader user base. An impressive array of servers and network infrastructure work together to keep us at the forefront of the hosting industry, allowing us to provide efficient and dependable hosting services - as well as peace-of-mind to our customers. This is ensured by our state-of-the-art operations hub in Singapore equipped to maximise reliability and security and to minimise downtime for your website and email - if there's even any. For in the end, what you'll receive is not just a truly unparalleled level of service, but one that's sure to keep you satisfied.